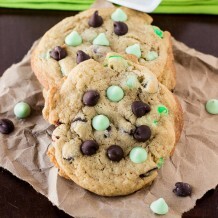 When I think about mint chocolate chip, I think about my Dad and I going to get mint chocolate chip ice cream together. Every time I’m home we always make a trip to our local ice cream shop to get a double scoop of mint chocolate chip ice cream on a waffle cone. YUM! So when I asked my Dad what he wanted me to make him for his birthday, he said to surprise him. 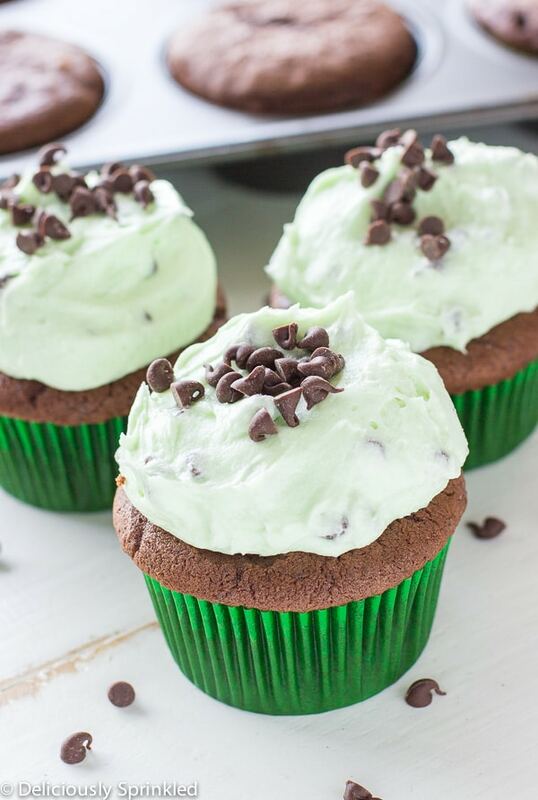 Well, I didn’t have to take too much time to think about what I wanted to make him for his birthday because these Mint Chocolate Chip Cupcakes were the first thing that came to my mind. 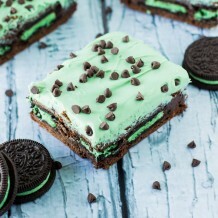 It’s like mint chocolate chip ice cream and chocolate cake in one which equals perfection! These chocolate cupcakes start out by using my new favorite Pillsbury Purely Simple Chocolate Cake Mix , which is super simple to make, just add butter, milk and eggs. 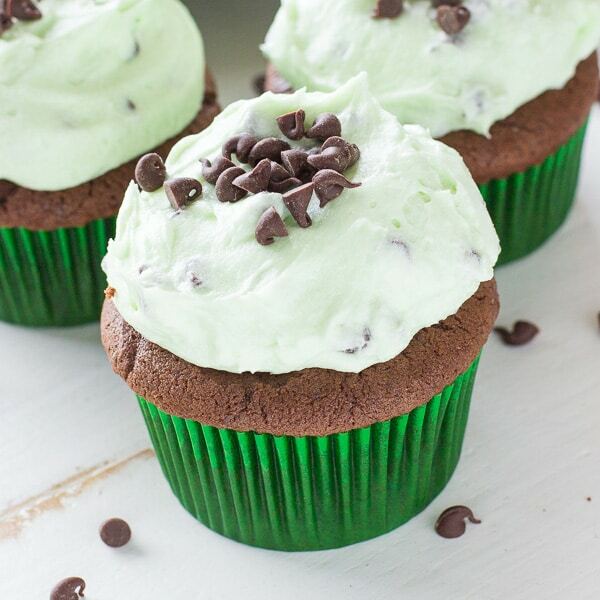 To make this delicious mint chocolate chip frosting, I used my new favorite Pillsbury Purely Simple Buttercream Frosting Mix and added mint extract and mini chocolate chips…it taste just like mint chocolate chip ice cream but in frosting form. 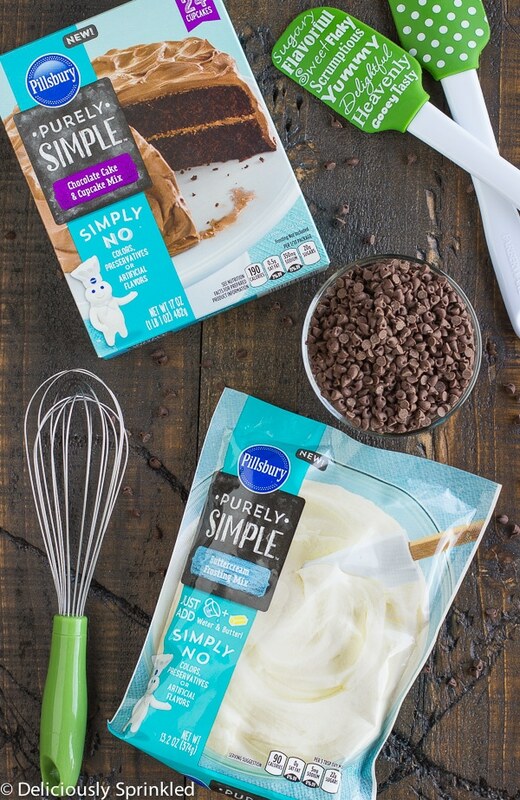 WHY I LOVE PILLSBURY™ PURELY SIMPLE™ MIXES: Pillsbury’s new line of mixes have no colors, preservatives or artificial flavors. It’s like having all the dry ingredients from your pantry PRE-MEASURED for you which that makes baking even easier. I honestly, might never make a cake completely from scratch again because these Pillsbury™ Purely Simple™ Cake Mixes are the BEST! SOFTENED BUTTER: For both the chocolate cake mix and the buttercream frosting mix you will NEED to use softened butter. So if you are like me who always seems to forget to set the butter out on the counter to let it soften, here is a trick to soften butter quickly. To soften butter directly from the fridge, place stick of butter unwrapped in the microwave for 10-15 seconds. SCOOPING THE BATTER: I like to use an ice cream scooper not only to frost these cupcakes but to also fill the cupcake batter into each cupcake tin. 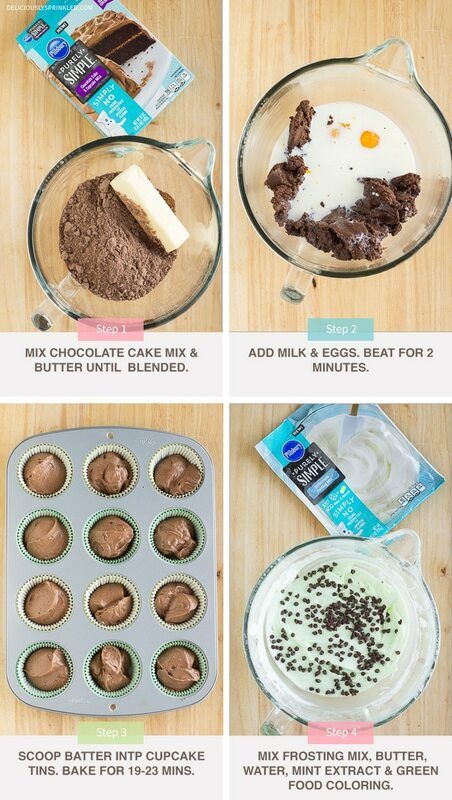 It makes it super easy and you know that each cupcake will be the same size. PRE-STEP: Preheat oven to 350F degrees. 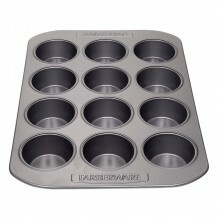 Line (2) cupcake pans with 24 cupcake liners. Set aside. STEP 1: In a large bowl, using an electric or stand mixer, mix cake mix and butter together until blended. STEP 2: Add milk and eggs, mix to combine for about 2 minutes. STEP 3: Fill each cupcake liner about 1/2 the way full with cupcake batter. Bake 19 to 23 minutes or until toothpick inserted in center comes out clean. Allow cupcakes to cool before frosting. STEP 4: In a large bowl, using an electric or stand mixer, beat frosting mix and butter for 1 minute or until blended. STEP 5: Add water and mint extract. Mix until frosting becomes light and fluffy. STEP 6: Fold in mini chocolate chips. Frost cupcakes and top with mini chocolates. This post is sponsored by my friends at The J.M. Smucker Company. 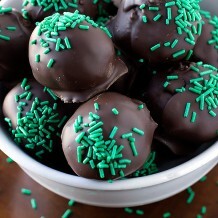 These look so simple yet tasty! I love the pop of color of the frosting!